Night Lights illuminate Naples Botanical Garden. Photo courtesy of Naples Botanical Garden. An ice sculpture draws a crowd on Third Street South. A Hanukkah celebration is held on Mercato Lawn. 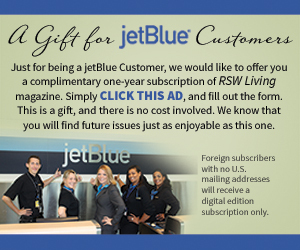 Photo courtesy of Jewish Federation of Collier County. Photo courtesy of Naples Botanical Garden. The hottest holiday ticket in Naples is getting even hotter. 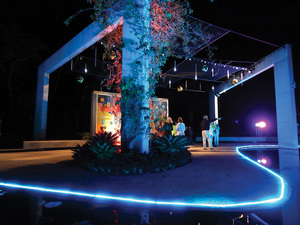 More lights on more nights are planned for the annual Night Lights in the Garden at the Naples Botanical Garden, a show-stopping, magical illumination event that brings in thousands of people each year. The dates are Dec. 8 to Dec. 23; Dec. 26 to Dec. 30, and Jan.1 to Jan. 3, 2018. Celebrate the holidays in a lush tropical paradise that is transformed into a spectacular light show as the sun sets. Each evening includes holiday musical performances, family activities, festive treats and the enchanting illumination scenes throughout the garden. The lights bring all ages into the garden to see the spectacle. 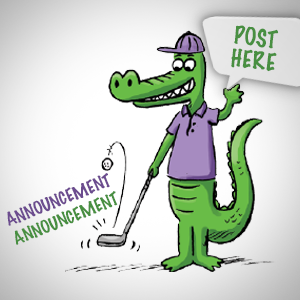 Naples Botanical Garden members can purchase their tickets early during an exclusive offering through Nov. 13. The public can buy tickets beginning Nov. 14. Tickets must be purchased prior to the event and are available at the ticket window from 9 a.m. to 5 p.m. daily and from 8 a.m. to 5 p.m. on Tuesdays. Tickets are also available on naplesgarden.org. A Community-Wide Hanukkah Celebration brings hundreds of people together to celebrate their faith and culture. The celebration in Naples will be held at the Mercato Lawn on Wednesday, Dec. 13 at 5 p.m. 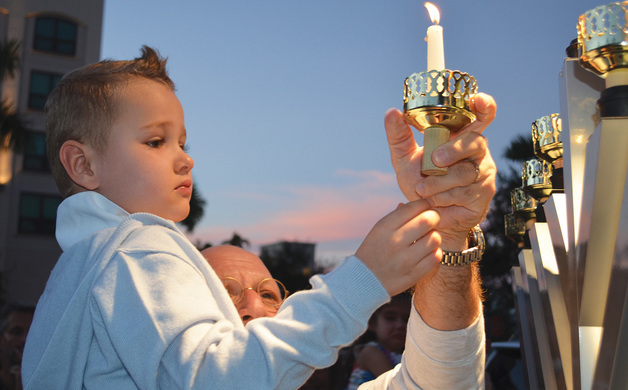 The annual event, hosted by the Jewish Federation of Collier County, brings together members of local synagogues as well as community members of all faiths. The event includes a latke-eating contents, music, kids’ performances and the lighting of the menorah. Check out jewishnaples.org for more information. Christmas in Naples begins on Third Street South during the third week of November with the Annual Tree Lighting & Festival. 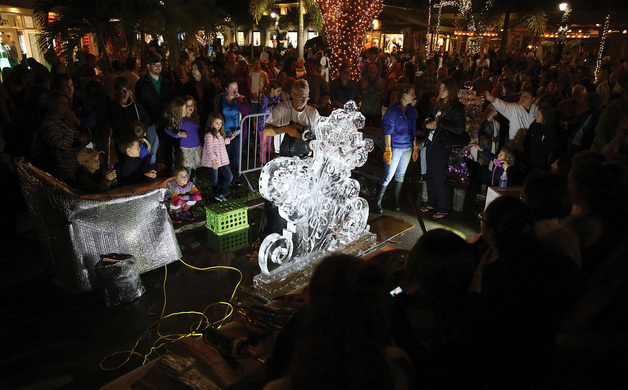 Santa Claus will attend this holiday extravaganza—where it snows in downtown Naples! Naples Mayor Bill Barnett will light the official Christmas tree, while this trendy, exclusive shopping district comes alive with red and silver decorations, music, bells, singing, dancing and fabulous holiday treats for visitors. The courtyards and plazas are filled with holiday cheer. Go to thirdstreetsouth.org for further details. There’s nothing cooler and truly Southwest Floridian during the holiday season than the Naples Christmas Boat Parade. Boats decorated with lights strung from bow to stern in clever holiday motifs fill Naples Bay on Saturday, Dec. 9 between 6:15 and 8:30 p.m. Thousands crowd the coastline as everyone from Santa Claus to Rudolph the Red-Nosed Reindeer to assorted snowmen light up Naples. A crowd favorite holiday event, dozens of boats take to the water to show off their best holiday look in front of a panel of judges. The boat parade, presented by the Marine Industries Association of Collier County, may be viewed from Naples City Dock, Naples Landing, Bayview Park and some nearby restaurants. Learn more about the parade at miacc.org. A local charity, the Ricky King Fund, benefits. For those who love the beach—especially the beach at night—and for those who love fireworks, Naples is the place to be on Sunday, Dec. 31 around 9 p.m for some New Year's Eve Fireworks. That’s when the fireworks start from just off the coast. Ringing in the New Year is a true Naples tradition with some sky show-watchers finding a spot at sunset and staying put until night falls and the fireworks fill the skies over the Gulf of Mexico. Tens of thousands line the beaches from Gordon Pass north to past Lowdermilk Park to enjoy the booming lights over the pitch-black Gulf. Written by Brigid O’Malley, a writer living in Southwest Florida.